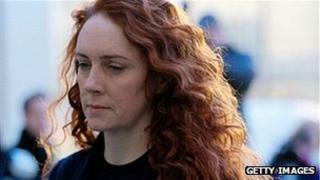 Rebekah Brooks, the former head of News International, was paid £10.8m after she resigned, it has emerged. The figure, compensation for loss of office, appeared in the company's accounts, released on Wednesday. Mrs Brooks resigned in July 2011 shortly after the News of the World closed because of phone hacking allegations. The accounts for the year to July 2012 also show the group set aside £17.5m to cover legal fees and damages. That figure relates to existing claims only, and could rise in the future if it receives more, News International said. Individuals who have received payments from the company include the parents of the murdered schoolgirl Millie Dowler and the singer Charlotte Church. Mrs Brooks, who has been charged over alleged payments to police and public officials, was a former editor of the News of the World and the Sun newspaper, and later rose to chief executive of News International. She appeared at the Old Bailey last week and is due to face trial in September next year over alleged illegal payments to public officials. The company said this financial year contained a "high level of uncertainty" due to potential damages and legal costs which may be payable as result of the legal action by those alleging their private messages were intercepted by the News of the World in search of stories. News International Group is a subsidiary of Rupert Murdoch's News Corporation and owns both the Times titles as well as the Sun newspaper. Its accounts show it lost £153m in the year to July 2012 compared with a profit of £113m a year earlier. The group said one of the main causes of the loss, £46.6m, was the closure of the News of the World, which published its last edition in July last year. More than half of this is legal fees, it said. In addition to that there is the £10.8m loss of office payment and £2.9m in charitable donations from the sale of the last News of the World. Separately, the editor of the Times, James Harding, has announced his resignation. He will leave within a month and is expected to be replaced by Sunday Times editor John Witherow. . In an address to staff, Mr Harding implied that the decision was not entirely his: "It has been made clear to me that News Corporation would like to appoint a new editor of the Times. "I have, therefore, agreed to stand down. I called Rupert this morning to offer my resignation and he accepted it," he said. Mr Harding could move to Mr Murdoch's publishing firm, Harper Collins, BBC business editor Robert Peston says. Rupert Murdoch said: "James has been a distinguished editor for the Times, attracting talented staff to the paper and leading it through difficult times. "I have great respect for him as a colleague and friend, and truly hope we can work together again." Mr Harding, who is 43, was one of the youngest journalists to take charge of the paper. The change at the Times newspaper comes hard on the heels of another move at the top of Mr Murdoch's company. Last week, the chief executive of News International, Tom Mockridge, who had taken over from Mrs Brooks in July 2011, said he would leave his role before the end of the month. Rupert Murdoch, chairman and chief executive of News Corp, said that Mr Mockridge's decision was "absolutely and entirely his own". News Corp plans to split into two businesses, separating its newspaper and book publishing interests from its now dominant and much more profitable TV and film enterprises.